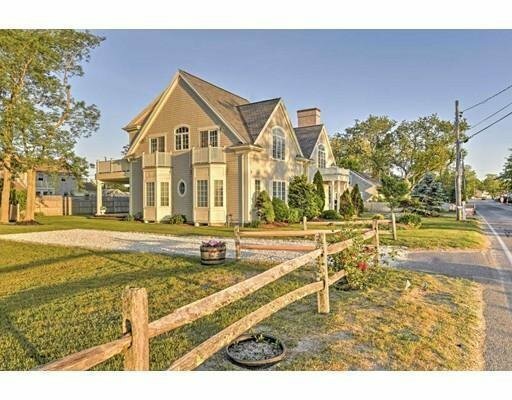 This Custom built, 4 bedrooms 4 full baths, boasts a floor plan that takes excellent advantage of natural light with great view of Barnstable Harbor through the large windows and sliders. The rooms are spacious, the ceilings are high with crown moldings throughout the house. The kitchen features stainless steel appliances, granite countertops and an island with ample counter space with wet bar/breakfast bar. The large open concept 2nd floor offers a, combination kitchen, living room and dining area. The master bedroom has a slider to the huge deck with an en-suite with Jacuzzi and a double open shower. The large sunny deck has a natural gas grill and below the deck is shady comfortable patio with an outdoor shower. The list of amenities is long so call for a complete list of features.